As U2log.com reported earlier, Bono will speak on the topic of global poverty and AIDS at the World Affairs Council International Speaker Series event in Portland, Oregon, next Wednesday (Oct. 20). The event, which will take place at Rose Garden Arena, is open to the public. Tickets are still available to purchase through Ticketmaster. 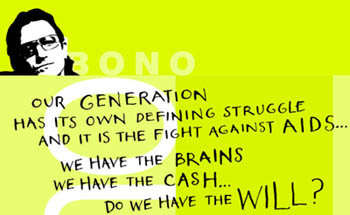 As a bonus to the program, ticketholders are offered the unique opportunity to submit a question for Bono through the World Affairs Council of Oregon’s web site. This will be Bono’s only public speaking engagement in the Northwest this year.